In February 1945, Israele Zolli, chief rabbi of Rome's ancient Jewish community, shocked his co-religionists in Italy and throughout the Jewish world by converting to Catholicism and taking as his baptismal name, Eugenio, to honor Pope Pius XII (Eugenio Pacelli) for what Zolli saw as his great humanitarianism toward the Jews during the Holocaust. Almost a half a century after his conversion, Zolli still evokes anger and embarrassment in Italy's Jewish community. This book is the first authoritative treatment of this astonishing story. What induced Zolli to embrace Catholicism will probably never be known. Nonetheless, by painstaking scholarly detective work, through interviews in Italy and elsewhere, through the unearthing of private papers not previous known to exist, and through the study of previous inaccessible archival materials, the authors have succeeded in explaining why Zolli left the Jewish fold and joined the Catholic Church. 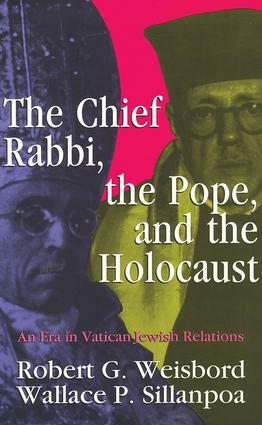 Like Zolli's rabbinical career, Pius XII's long pontificate tells us much about the Church of Rome and its relationship to the Jewish people, particularly with reference to the issue of conversion. The authors focus on the pontiff's World War II policies vis-A-vis the Jews, a subject that has been heatedly debated since Rolf Hochhuth's The Deputy was performed in the early 1960s. What Pacelli knew abut the extermination of the Jews and when he knew it, what he said and failed to say, are given special attention in this book. Through the examination of previous scholarship and primary materials (including Pius XI's encyclical on race and anti-Semitism, Pacelli's behavior is evaluated to determine if Zolli accurately gauged the Holy Father's efforts to save Jews. This saga of the two Eugenios will interest historians of the Second World War and the Holocaust and students of history alike.